White winters in Canada is a major part of the country’s character. Across Canada events and festivals are held throughout the winter months, from ice sculptures to ice skating, dining, music and even beard growing competitions. Winters in Canada are an inevitable reality and somewhat inescapable, and they are a major contributor to the country’s character and national identity. Canada is generally cold between the months of November to March, but that doesn’t mean Canadians stay indoors, as winter means the stage is set for some of the country’s biggest and most popular festivals and events. All across Canada a number of events and festivals are held throughout the winter months, from ice sculptures to ice skating, dining, music and even beard growing competitions. Quebec comes alive with the Quebec Winter Carnival, starting in January and continues for the next two weeks with fun and merry-making in sub-zero temperatures. Lasting a total of 17 days, the world’s largest winter festival the Quebec Winter Carnival has been a highlight of the city’s events calendar since 1894 and has given people of the city enough reason to smile and celebrate during the cold snowy winters. Despite facing some of the world’s coldest winters, Quebeckers and thousands of visitors see no point in fighting the cold, rather, they embrace and celebrate it. Location – A family friendly event, the Quebec Winter Festival is held at various locations in Old Quebec, they are held within 1 km of each other which means revelers can walk from one location to another. Almost all Carnival events are held outdoors, and appropriate dressing is a must especially for children. Price – To enter into the festival you need to buy a Bonnehomme effigy tag that costs CAD $15 to get into most of the Winter Carnival events, and is available in most of the city’s kiosks and other outlets. Some activities might cost extra, but families can still have a full fun day with just the purchase of the Carnival Bonhomme effigy. Activities – Activities include, night parades, slide runs, concerts, snow sculptures, Ice Palace and skating, there is even a fun filled crazy canoe race across the St-Laurence River that requires peddlers to navigate through a patchy and narrow waterway and the paddlers alternate between paddling and carrying the canoe. Naturally most people think of Niagara Falls as a place to visit in summer, however, winter turns this Canadian attraction into a calm and magical place to be. Even though winter temperatures are often below zero during the winter months of November and February, the Niagara Falls remains open and there is still much to do, such as the Niagara Falls Winter Festival of Lights. 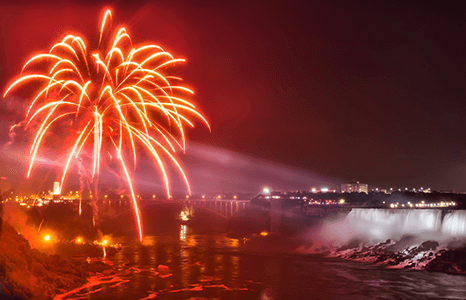 The Niagara Falls Winter Festival of Lights takes place from the beginning of November to the end of January, which sees a spectacular light show that includes an awesome illuminated 5 km route of lighting displays, fireworks over the falls, including concerts and children performances and a lot more. Price – All the Niagara Falls Winter Festival lighting shows are free of charge, though donations are gratefully accepted. Activities – Most of the events take place in the heart of Niagara Falls and close to the major hotels and Clifton Hill. Drawing crowds of thousands of music lovers, Igloofest is an annual outdoor music festival that takes place at the Old Port of Montreal, in Montreal. Co-produced by the popular electronic music DJ Piknic Electronik, the festival has been going on for the last eleven years and is the go-to event for electronic music lovers the world over. The annual winter music festival runs from January to February and this will year in celebration of Montreal’s 375th anniversary the special edition Igloofest will run for 6 weekends with twelve regular night winter shows to celebrate the occasion. The event brings together some of the best local and international electronic music DJs on a giant playground and the music festival also has some unique competitions, such as the winter wear competition colorfully named “Iglooswagg”. Then there is the “one-piece” contest whereby the contestants show off their one-piece suits and post the pictures on the official Igloofest website. Winners can walk away with expensive winter clothes and some of the most sought after V.I.P tickets. Some of the most notable performers at the festival over the years include, Renaissance Man, Jesse Rose, A-Trak, and Thomas Schumacher, just to mention a few. Ticket prices are very affordable, a regular ticket costs $22 and V.I.P tickets start from $55 to $120. Kicking off the winter festival activities and holiday season, the Toronto Cavalcade of Lights has been around for the last 50 years. A festive evening at Toronto city Hall that features the illumination of the city’s official Christmas tree, performances by Toronto’s top Musicians and artists, fireworks show and skating party at Nathan Phillips Square, a magnificent public area outside the City Hall. 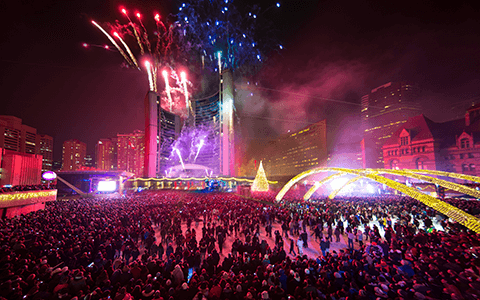 Held on the last Saturday of November, the Toronto Cavalcade of Lights is free of charge, the evenings live music is varied and includes rock, jazz, soul and gospel performances by top Canadian musical artists. There is also lots of restaurants and eateries around Nathan Phillips Square, offering very affordable noodle joints and steak houses. Other attractions within walking distance of the festivities include the CN Tower, the Hockey Hall of Fame and so much more. If you are someone who would rather celebrate winter by staying indoors with a nice hot meal, Winterlicious is the one for you. For Winterlicious, hundreds of Toronto most talked about restaurants offer exclusive prix-fixe menus in three price ranges for both lunch and dinner. The city of Toronto makes it easy to check through menus and make bookings online. One of the reasons why Winterlicious has become so popular is that you are allowed to make book reservations at spots that are normally way too popular to allow them, so you often avoid long waiting periods for a table. The culinary event series offers a variety of experiences including cooking classes and demonstrations, dinner theater, tastings and pairings, intimate chef dinners and so much more. Each menu includes starters, entrees, and desserts, featuring each restaurant’s specialties. These awesome fine-dining experiences cost around $18 to $28 for lunch or $25 to $45 for dinner per person, and reservations typically start from the second week of January. Winters in Canada typically run from November to early April and the temperatures can get very low, but the snow still warrants a proper winter party all across the country. The time is now to start your holiday visa application process, and we at CanadianVisa.org through our professional and highly experienced Regulated Canadian Immigration Consultants (RCIC) will guide you through every step of the application process to make sure you don’t miss these awesome annual winter festivities. We offer a variety of visa options such as tourist visa, working holiday visa, and many temporary visas are also available. The winter season draws in thousands of athletics types eager to hit the slopes, and there’s plenty of opportunities for outdoor concerts, dance parties, film viewings and photography contests you name it Canada has it.